Montreal-based reporter Domenic Fazioli claims that Zehaf-Bibeau appears three times in Montreal's court database. Allegedly the recent convert was arrested five times, three times for drug possession and twice for violating parole conditions. His name also appears in Vancouver's court database on charges of robbery and making threats. Whether Zehaf-Bibeau was the only attacker that killed 24-year-old Nathan Cirillo and wounded at least 2 others is still unknown. Earlier Ottawa police spokesman Chuck Benoit said two or three gunmen were believed to be involved in the attacks, but at a press conference officials declined to comment on the possible number of shooters. The news of the shooting broke at 9:52 am local time when the gunman killed a soldier at the National War Memorial before reportedly proceeding to the Parliament Hill's Center Block where he was shot dead by a 58-year-old sergeant Kevin Vickers. 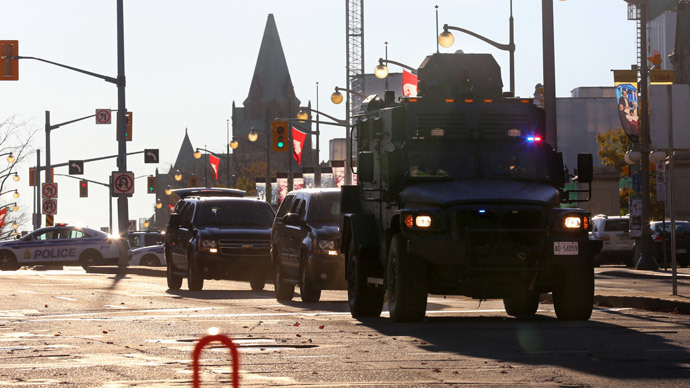 The safety perimeter in the downtown core was lifted at 8:30 pm while Parliament Hill remains off limits to the public. 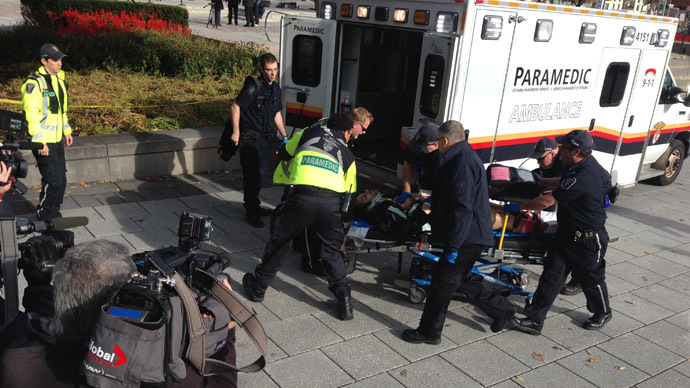 The attack on the Parliament in Ottawa comes two days after another recent convert to Islam, 25-year-old Martin Couture-Rouleau ran over a soldier and injured another with his car before being shot to death by police. Couture-Rouleau was allegedly a supporter of Islamic State. On Tuesday, RCMP Commissioner Bob Paulson said Rouleau also had his passport revoked as he was one of the 90 people being looked at in an ongoing national security probe as he was attempting to travel to Syria. Addressing the nation from an undisclosed location on Wednesday evening, Canadian Prime Minister Stephen Harper said the country will never be intimidated by something like the two outrageous attacks this week. Last Friday, the terrorism threat level in Canada was quietly elevated from low to medium for the first time since August 13, 2010, according to an internal document obtained by Global News. “Intelligence indicates that an individual or group within Canada or abroad has the intent and capability to commit an act of terrorism. [Integrated Terrorism Assessment Centre] ITAC assesses that a violent act of terrorism could occur,” the document says. The document warns that “self-directed extremists” inspired by the Islamic State are most likely to attack Canada through “small cells or as lone actors to carry out simple, small-scale attacks.” Authorities believe that some 130 Canadians are currently abroad supporting terrorism, including more than 30 in Iraq and Syria. At least 80 Canadians are believed to be back on home soil after visiting conflict zones, it says.